Seems like I have seen an inordinate number of deer hit and killed on the roads this summer, what about you? Every auto deer kill is a shame, but the 2 below really hurt. 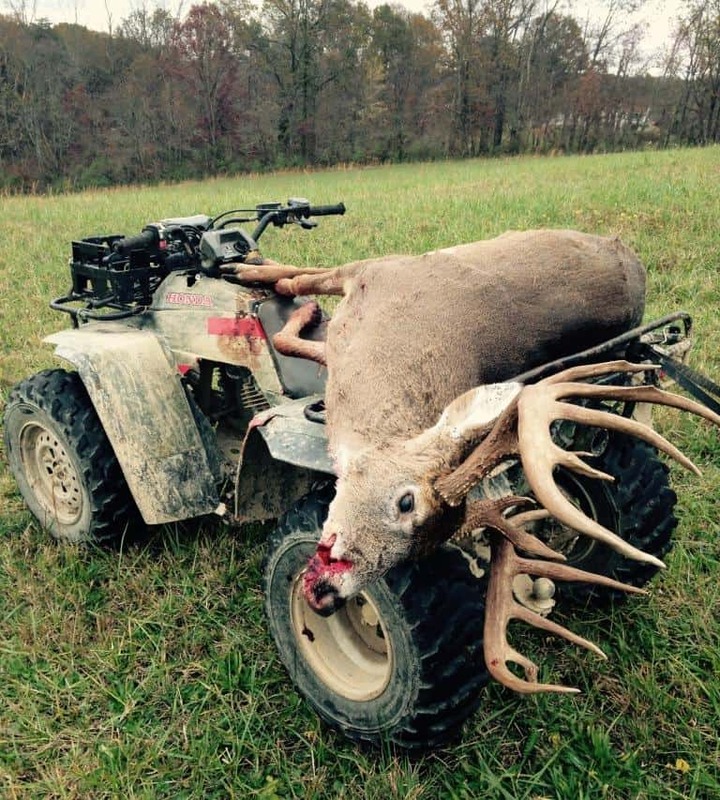 This 200″ plus non-typical was reportedly killed in the Fort Campbell area of Kentucky. I bet the hunter(s) who were scouting that giant are sick. I bet trail-cam pictures of this deer will surface soon. 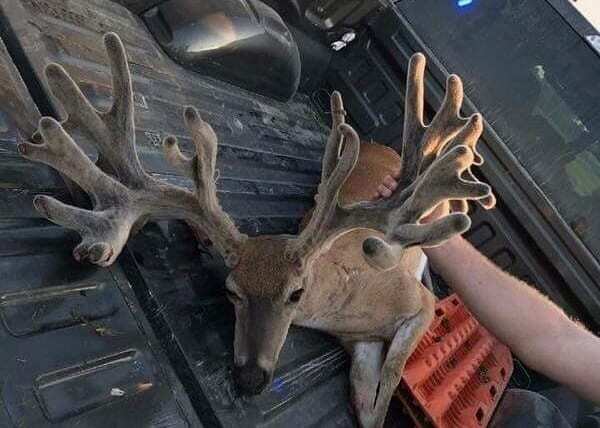 Word is this cool buck was found roadside in Indiana. In addition to the rack, beautiful dark face. 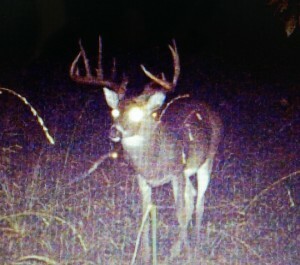 This buck died weeks ago, his rack would have grown a bunch more now. Last year I posted on Mr. Clyde Roberts and the buck he shot from a tree stand during the 2015 Virginia deer season. Still hunting strong at 103 years young, Mr. Clyde shot his biggest buck ever during our state’s 2016 muzzleloader season. I (saw a deer and) held my hands out in front of me to describe antlers and he just smiled. I knew things were going to happen quickly, so he got the gun up and ready. Papa was so calm when the buck walked out broadside. I knew he was a great buck and time literally stood still for me. I never heard the gun go off, never saw the smoke, just watched the buck fall with one well-placed just shy of 100 yards. Papa likes to tell everyone that I got so excited after that. Of course I did! Not only had I been able to hunt with my 103-year-old grandfather but I had witnessed him take the biggest buck of his life. Most importantly, I had the hunt of my lifetime with him! It was one of the most awe-inspiring moments of my hunting career. I will never forget it. Papa is still on cloud nine and I have relived the hunt every night since. Interestingly, Mr. Clyde was not always a hunter. 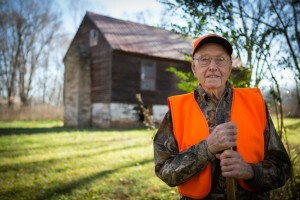 He started hunting in his retirement years at the urging of his son Mike—40 years ago. 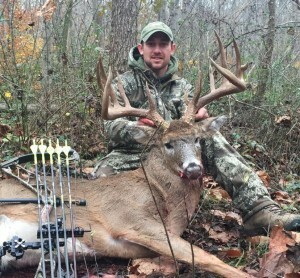 As I blogged last year, this story makes me proud to be a Virginian, a Christian and a deer hunter. Mr. Clyde Roberts, you are a great man and an inspiration to all of us. Side note: Our producers are planning to be in touch with Mr. Roberts and his family, and we hope to visit Bedford County and film a TV segment with him soon for an episode of BIG DEER TV to air later this year on Sportsman Channel. 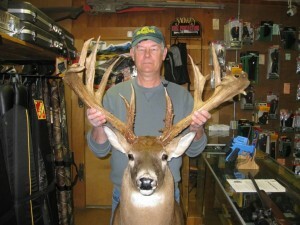 Ohio: Giant Bow Buck, 186 6/8! Mike: I still have family in Ohio and have hunted there my whole life. About 5 years ago my buddy and I really started managing the Ohio farm we hunt. It didn’t take long for results to start showing. I run some 9 cameras on 500 acres. One October, we got pictures of a true giant. I hunted him hard all year as the wind would allow to no avail. I think the deer actually had me patterned, ha! Two times I got pictures of him at my stand 15-20 minutes after I had left the stand. Last year I got pics of a cool non-typical so I set out after him. On October 2 at 10:45 am, after 5 days of hunting the deer, I began thinking about and dreading the 7-hour drive home. As I stood up in my stand, I turned and saw a huge-framed deer making his way down the ridge. At 31 yards he put the brakes on, and I was able to get a shot. I didn’t realize how big he really was until the recovery. The buck is a 9-point that grossed 169 1/8.” That deer got me fired up even more about managing for mature bucks. This year I stepped up the supplemental feeding and trail cameras. My goodness I started drawing in even more deer! In October we started getting pictures of some mature bucks, and on October 24th I started getting pictures of the one that I would hunt. 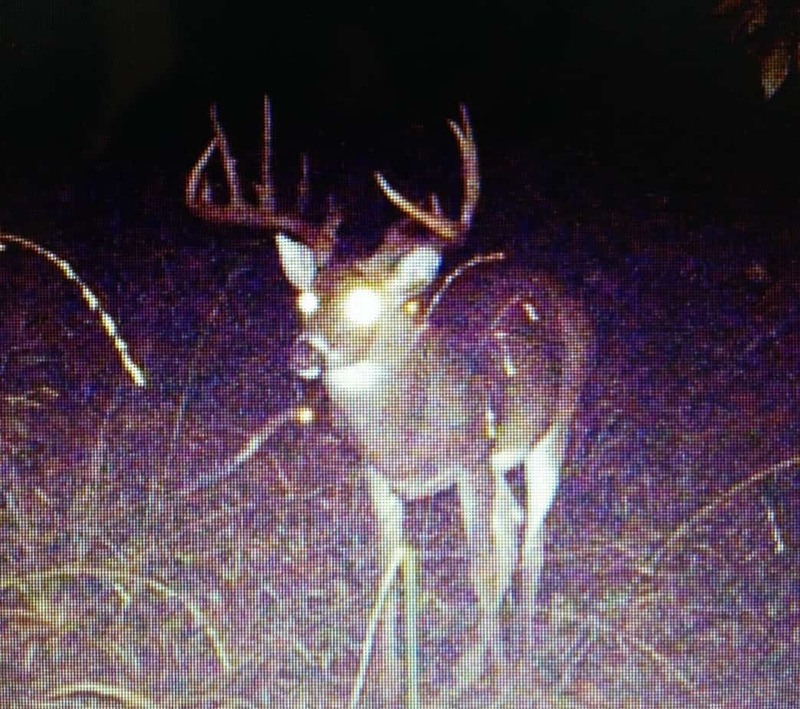 Of 10 cameras scattered around the farm, I was getting pictures of him on only 3; they were all at night and they were around the SW corner of the farm. That helped me narrow down his bedding area but made hunting him difficult. The closest I could get to him was in a thick, nasty creek bottom that would leave me limited on shots. The best I could do would be to hunt on a W wind, and that was pushing it. Feeling the only time I could get a good chance at the buck was if and when he got on a hot doe, I waited and watched the weather. With a late 2nd full moon this year I was unsure… I had my doubts, but on November 5th the weather forecast looked good with W winds, so I packed up and headed north. I snuck in the creek bottom and set up a Millennium lock-on. On Monday the 7th, I saw 11 different bucks cruising that bottom, and I had a feeling my timing was good. Tuesday I hunted daylight to dark and only saw 5 deer total; my mind started wandering…second guessing myself. But I decided as long as the wind was good I would stick it out. Wednesday I snuck back into the stand. The morning was slow. By 10:45 a.m. I hadn’t seen a single deer. I started texting a friend who was hunting in Illinois to see if it was slow there too… It was, he texted back, ha ha. I love hunting the rut, seeing bucks cruise and chase does, fight and carry on, but I had never seen this. At 11:15 am the woods exploded with noise. The big buck was chasing a doe across the near ridge; they were both running as hard as they could through the thick woods. The doe made a hard cut right and the buck plowed into her! They both lost their feet and slid on their sides. They regained their footing, the doe jumped the creek and turned to face the buck as he made the rest of the way down the ridge. At this point the doe was about 25 yards from me, quartering away, and he was 32 yards, quartering to. My sight was set on 30 yards. I came to full draw and put the pin just in front of his right shoulder. My mind was clear and I started squeezing the shot. The arrow left the bow about the same time the buck decided to take off and resume his harassment of the doe. I heard the arrow smack and I was sick. 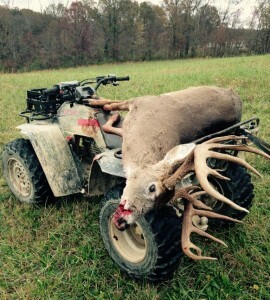 The buck wheeled around with about 20″ of arrow sticking out of his face! I immediately started cussing myself. The first thing I thought was that I would check all my cameras for the next few days to see if I could get pictures of the buck to assure he was still alive. I watched him run about 30 yards and he stopped. I could see that the arrow had entered his mouth and cut the jugular vein. He made it another 20 to 30 yards and fell dead. Emotions ran wild. I called my wife, and she started crying, and heck I think I was crying. I had the deer green scored by an official—186 6/8 inches. After the 60-day drying period, if the measurements hold, he will be the new Jackson County typical record. But no matter how that plays out, I couldn’t be more proud and humbled. What an amazing deer. Mike, my wife and I love your show and what you stand for. If you’ve ever got an Ohio tag burning a hole in your pocket give me a shout. Thanks again, Paul M.
Hanback note: Before anybody comes on here and starts criticizing Paul and the shot, let me say that after more than 30 years of bowhunting whitetails, I have seen and experienced some bizarre and hard-to-explain things. The reaction time of a big buck, milliseconds, is truly astounding, whether he turns to run, takes off after a doe, ducks the string…whatever. I have watched in shock, awe and horror as bucks ducked, jumped and twirled, with my arrows sailing over or under them, and on occasion hitting nowhere near where I aimed. If you have bowhunted much and shot at many whitetails, you know what I’m talking about. One time, I will never forget it, I shot at the left shoulder of a fine 11-point buck. The arrow hit with a twack, and the deer ran, spraying blood. I was feeling good and proud as I walked up to the buck. Upon examination, I saw that the arrow had entered the right side of his neck and passed through. Astonished and perplexed, I had the cameraman review and slo-mo the tape. As the arrow cut 20 yards through the air, the buck ducked, whirled and did a complete 180 flip! The arrow hit the opposite side of the deer that I had aimed at, sliced through the right side of his neck and exited left. He ran about 50 yards and died quickly, as Paul’s buck did, and I was humbled and extremely grateful. 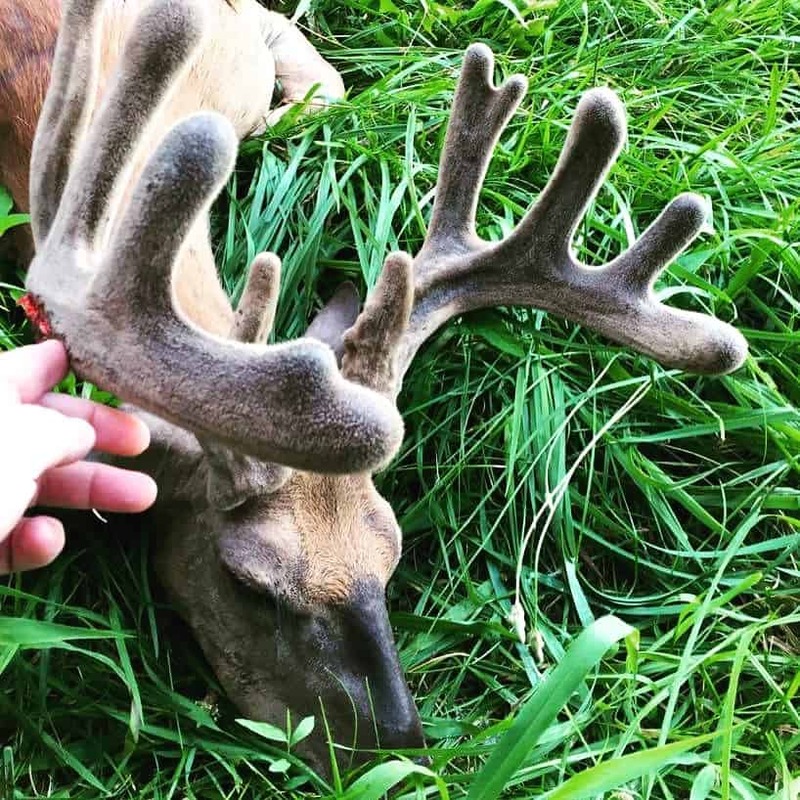 Strange things happen in the deer woods, especially when you’re archery hunting. Nothing surprises me anymore, but when things work out well in the end, it’s all good. Opening day of bow season in Virginia, I went behind my house in the morning because I only had a few hours to hunt. I saw a fawn come by, but not much else. I noticed rubs on big cedar trees that were fresh. I decided to come back in the afternoon when I had more time. When I returned later that day I saw squirrels, birds and a few hawks flying around. Daylight was starting to fade when I saw movement, a decent 6-pointer. I stood up slowly and grabbed my bow but noticed that behind him was a nice 8-pointer. As they fed on acorns, I noticed another buck coming in, a huge 7-pointer. They fed on acorns for about 5 minutes, and had no idea I was standing there, bow in hand, ready to draw back. Finally, the time had come. I took a deep breath, and told myself to take my time and don’t mess this up. I put my pin on the 7-pointer, slowly pulled the trigger back and let my arrow fly. I knew the shot was good when he did a mule kick and took off only to hear him crash about 60 yards away. I put my bow up and that’s when the buck fever kicked in–my legs turned to Jello! I started shaking…it took me about 20 minutes to get myself together enough to climb down. Great buck and story Chris, way to go man! One of the biggest 7-pointers I’ve seen in a while. The new season of Big Deer TV premieres in July on Sportsman Channel and airs through the end of the year. More later on days and air times. 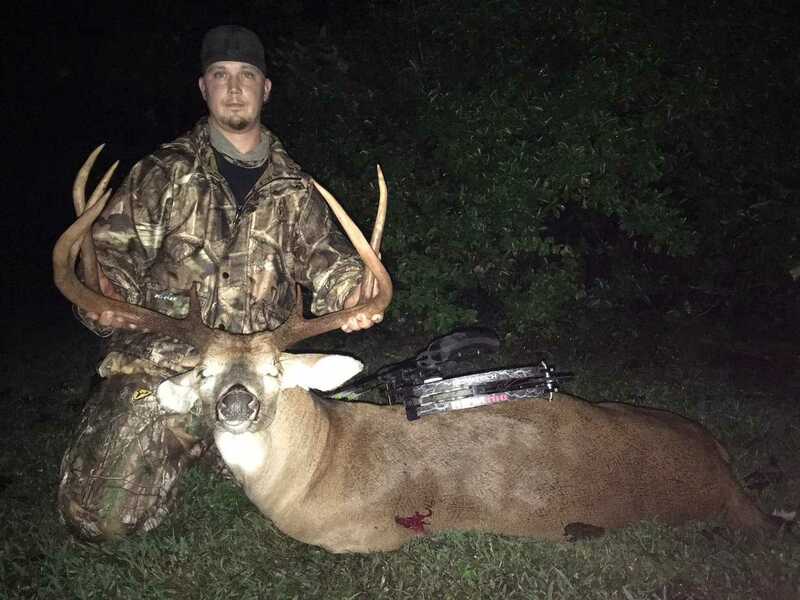 One of the episodes we’re working on right now is a compilation of conversations and interviews I’ve had with regular hunters across the nation who have shot monster whitetails. 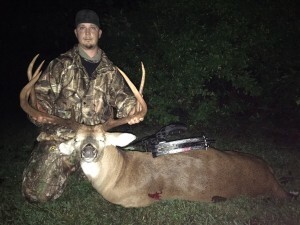 I love to hear these guys tell their stories of the 180- to 200-inch dream bucks they shot, and I think you will too. On November 17, 2007, Jimmy, who works at the farmer’s coop and takes his vacation every year during the first week of the VA rifle season, climbed into his ladder stand about 4 PM. His brother had killed a good buck that morning, and he was riding Jimmy pretty hard about it, bragging and getting away with it as only a brother can. Jimmy heard crunching in the leaves and saw a doe. “She was really small,” he remembers. He heard more hoofs—a huge deer was behind her, “just meandering slowly, taking his time,” Jimmy said. With more than 40 years of deer hunting under his belt, Jimmy knew the buck was big, so he raised his .270 and fired. Jimmy had never seen the monster before, nor had anybody else. That is takeaway #1 from this story. Isn’t it fascinating how a world-class deer can come out of the woodwork, never having been seen before, dragged out into the open one November day by a sweet-smelling doe? This was an incredible deer from a region known for some good bucks, but rarely if ever a 200-incher. So remember, you might kill your dream buck anywhere, anytime. Don’t get discouraged if you’ve haven’t seen or shot a good buck in a while, maybe this will be your year. Jimmy’s brother heard the shot and came running. He kept up his ribbing, “I hope you didn’t let the big one get away!” until he saw the rack, and then he and Jimmy went crazy. Jimmy carried the head to a prominent VA taxidermist who has mounted some deer for my dad and me over the years. “Jimmy, that’s the biggest buck anybody has bought in here in 50 years!” he said. Tale of the tape: total points 20…spread 22 4/8…main beams 27 7/8 (R) and 27 1/8 (L)…total mass measurements 44 5/8…final score 201 7/8. No surprise Jimmy’s monster was first in the VA big-buck contest that year. 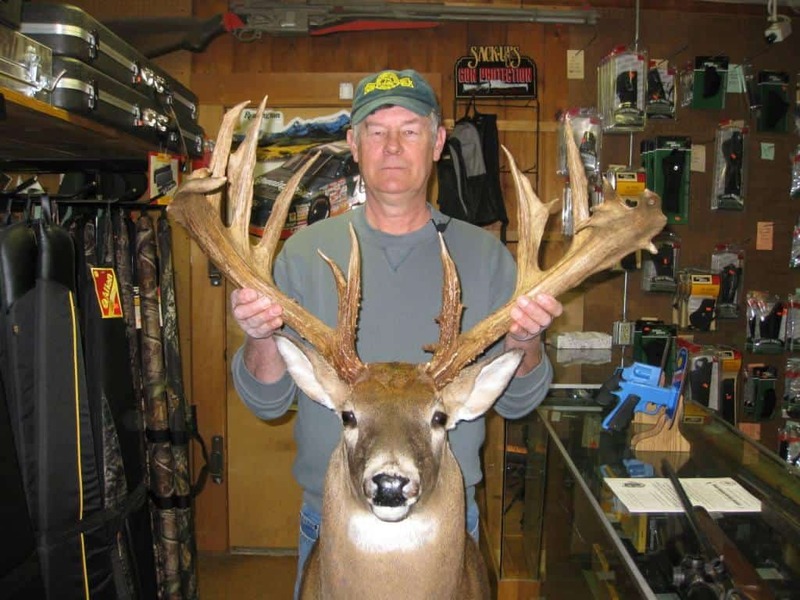 It is currently the 23rd largest NT ever shot in VA.
Postscript: Several months after shooting his dream buck, Jimmy heard that a kid riding a 4-wheeler had found an enormous shed antler in the area. He tracked the kid down and after some wrangling, acquired the huge chunk of bone that had fallen off the buck’s head some 9 months before Jimmy shot him. You’ll see and hear all about that on the TV show. Takeaway #2: The kid found the shed 500 yards from where Jimmy killed the buck. Proves once again that many old whitetails are homebodies, and the older they get the smaller their core areas get. Find a huge shed now and there’s a chance the huge buck will be living right there this fall.